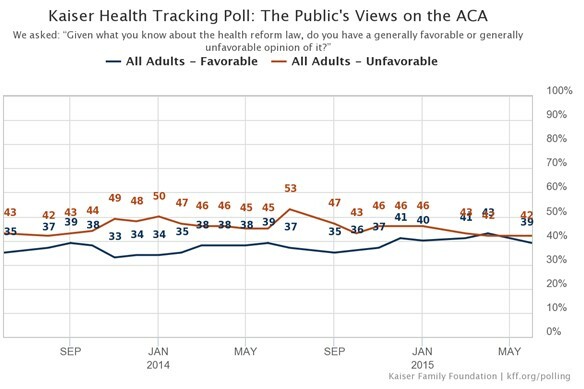 Who likes and who dislikes the Affordable Care Act (ACA), America’s health system reform law? In anticipation of the King v. Burwell Supreme Court decision, Kaiser Family Foundation (KFF) published its latest tracking poll gauging the public’s opinion on the ACA. Some results could be expected, while some might seem surprising. Overall, slightly more people dislike the ACA than like it: The number of individuals who reported a favorable view on the ACA (39 percent) declined three percentage points since April’s tracking poll, once again dipping below the number of people with an unfavorable opinion, which remained unchanged at 42 percent. Republicans have a more unfavorable opinion of the ACA (69 percent opposed), while Democrats have a more favorable opinion (65 percent in favor). Adults 50-64 years old had the least favorable opinion of the ACA out of all the age groups (48 percent unfavorable), while 18-29 year-olds were the age group with the highest percent of individuals reporting no opinion (28 percent). Blacks and Hispanics have a much more favorable opinion of the ACA (59 percent and 48 percent, respectively) than whites (33 percent), who were the highest percentage race/ethnicity group with unfavorable ACA opinion (50 percent).